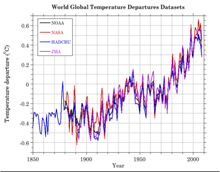 World global temperature departures from the 1951-1980 mean. The plot shows four data sets, including NASA, NOAA, the Climate Research Unit (CRU) of the University of East Anglia, and the Japan Meteorological Agency. All are very similar, and although there are significant overlaps between the respective data sources of these four agencies, each is applying its own analytical methods to that data. The CRU is the focus of what is often called "Climategate" — an allegation that climate researchers there (and presumably elsewhere) have used their scientific skill to conspire to produce a conclusion that matches their preconceptions, abusing their positions and violating their scientific integrity. The advocates of the Climategate position allege, among other things, that confirmation bias is at work in the scientific community and that global warming, if it exists at all, is not due to human activity. Scientists, including recently a scientist who had joined with the global warming deniers, have repeatedly debunked these allegations. Interestingly, it is the advocates of Climategate who may provide the clearest examples of confirmation bias. One example of a justification of this assertion relates to what is here called "Hear no evil, see no evil." Let us concede that, across any given field of scientific research, scientific integrity is rarely upheld perfectly and that in any area of scientific research, there are instances of scientific fraud. Two critical questions then become: "What is the incidence of scientific fraud, by field of research?" and "What is the expected incidence of scientific fraud in climatology?" Finding a single instance of scientific fraud does not in itself invalidate all research in a given field, nor does it invalidate the research done by others in that field, nor does it prove that the research performed in that field is any less credible than is the research performed in other fields. Any conclusion as to the credibility of climatological research must rest on some estimate of the integrity of the field itself relative to others. But Climategate advocates have done no such studies of which I am aware, or, at least, they have not publicized this element of the argument. For them it appears to be sufficient to call into question one group's work without establishing any kind of context for their subsequent conclusions. This could be explained as an unwillingness to test their conclusions, which is a hallmark of confirmation bias. Illustration courtesy The New Republic. Confirmation bias is a cognitive bias that causes us to seek confirmation of our preconceptions, while we avoid information that might contradict them. It can also cause us to tend to overvalue information supporting our preconceptions, and undervalue information in conflict with them. Last time, we explored indicators that confirmation bias might be taking place. Let's now explore how confirmation bias affects our thinking. Here are five ways people use confirmation bias — often outside their awareness — to reinforce their preconceptions. We use many techniques for avoiding information that conflicts with preconceptions. In meetings, we deprive people of the floor if we regard their positions as threats to our preconceptions, or we're inattentive when they speak, or we place their agenda items last, hoping to run out of time. We ignore what they write and we distract others from paying attention to their contributions. For conferences, we use peer review to exclude them from programs altogether; we assign them to small, undesirable, or out-of-the-way venues; we schedule them for undesirable time slots; or we schedule them opposite events that we expect to be heavily attended. Consider carefully the spectrum of information sources to which you do pay attention. When others make choices for you (as happens in conferences), think about what has been excluded from the program. Most research about false memories relates to the recovered memory techniques in common use a decade ago. In the workplace, false memories also play a role. When we recollect what someone said or wrote, we're risking confirmation bias. Take extra care when retrieving memories that support positions you hold — memory tends to provide data that supports what we believe, and it tends not to provide data that conflicts with what we believe. When reasoning is subtle, we sometimes make mistakes. But when reasoning isn't especially challenging, we can still make errors, especially when we hurry or we're under stress. Because of confirmation bias, these errors tend to favor our preconceptions. Examine carefully any reasoned argument that supports preconceptions. Accusations that survive being subjected to testing against evidence are more likely to be valid. By limiting such testing, confirmation bias tends to increase the likelihood that accusations are false. Accusations need not be verbalized. Even when they're merely thoughts, they affect how we interact with the accused. Such accusations are especially prone to confirmation bias, because they are rarely subject to confrontation with evidence. The "elephant in the room" The "elephant in the room"
our preconceptionsoften takes the form of information that contradicts what we hope to be true — information that contradicts our preconceptions. Confirmation bias helps us defend against these contradictions. When you sense the presence of an elephant in the room, check for contradictions of the group's hopes, dreams, and preconceptions. For more about "the elephant in the room," see "Stalking the Elephant in the Room: I," Point Lookout for June 9, 2010. For more about false accusations, see "Political Framing: Strategies," Point Lookout for May 6, 2009. Would you like to see your comments posted here? rbrenaevsXDbfYNvCskpOner@ChacLbdeHbkEaxyWvDHgoCanyon.comSend me your comments by email, or by Web form. See also Emotions at Work, Personal, Team, and Organizational Effectiveness and Cognitive Biases at Work for more related articles. I offer email and telephone coaching at both corporate and individual rates. Contact Rick for details at rbrenqeHmHzGhNvyVUNBener@ChacGVKnULREQxMYjcFHoCanyon.com or (650) 787-6475, or toll-free in the continental US at (866) 378-5470.